After an absence of well over half a century, Wall Street is back, center stage, as the preferred American icon of revulsion, a status it held for a fair share of our history. And we can thank a small bunch of campers in Manhattan’s Zuccotti Park for hooking us up to a venerable tradition of resistance and rebellion. Peering back at a largely forgotten terrain of struggle against “the Street,” so full of sound and fury signifying quite a lot, it’s astonishing — to a historian of Wall Street, at least — that the present movement didn’t happen sooner. It’s already hard to remember that only weeks ago, three years into the near shutdown of the world financial system and the Great Recession, an eerie unprotesting silence still blanketed the country. Stories accumulated of Wall Street greed and arrogance, astonishing tales of incompetence and larceny. The economy slowed and stalled. People lost their homes and jobs. Poverty reached record levels. The political system proved as bankrupt as the big banks. Bipartisan consensus emerged — but only around the effort to save “too big to fail” financial goliaths, not the legions of victims their financial wilding had left in its wake. The political class then prescribed what people already had plenty of: yet another dose of austerity plus a faith-based belief in a “recovery” that, for 99% of Americans, was never much more than an optical illusion. In those years, the hopes of ordinary people for a chance at a decent future withered and bitterness set in. Strangely, however, popular resistance was hard to find. In the light of American history, this passivity was surpassingly odd. From decades before the Gilded Age of the late nineteenth century through the Great Depression, again and again Wall Street found itself in the crosshairs of an outraged citizenry mobilized thanks to political parties, labor unions, or leagues of the unemployed. Such movements were filled with a polyglot mix of middle-class anti-trust reformers, bankrupted small businessmen, dispossessed farmers, tenants and sharecroppers, out-of-work laborers, and so many others. 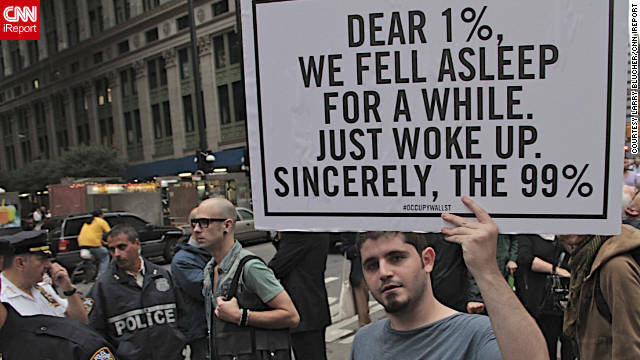 If Occupy Wall Street signals the end of our own, atypical period of acquiescence, could a return to a version of “class warfare” that would, once upon a time, have been familiar to so many Americans be on the horizon? Finally! What began as a relatively sparsely attended and impromptu affair has displayed a staying power and magnetic attractiveness that has taken the country, and above all the political class, by surprise. A recent rally of thousands in lower Manhattan, where demonstrators marched from the city’s government center to Zuccotti Park, the location of the “occupiers” encampment, was an extraordinarily diverse gathering by any measure of age, race, or class. Community organizations, housing advocates, environmentalists, and even official delegations of trade unionists not normally at ease hanging out with anarchists and hippies gave the whole affair a social muscularity and reach that was exhilarating to experience. Diversity, however, can cut both ways. Popular protest, to the degree that there’s been much during the recent past — and mainly over the war in Iraq — has sometimes been criticized for the chaotic way it assembled a grab-bag of issues and enemies, diffuse and without focus. 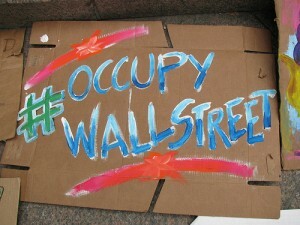 Occupy Wall Street embraces diverse multitudes but this time in the interest of convergence. In its targeting of “the street of torments,” this protean uprising has, in fact, found common ground. To a historian’s ear this echoes loudly. Karl Marx described high finance as “the Vatican of capitalism,” its diktat to be obeyed without question. We’ve spent a long generation learning not to mention Marx in polite company, and not to use suspect and nasty phrases like “class warfare” or “the reserve army of labor,” among many others. In times past, however, such phrases and the ideas that went with them struck our forebears as useful, even sometimes as true depictions of reality. They used them regularly, along with words like “plutocracy,” “robber baron,” and “ruling class,” to identify the sources of economic exploitation and inequality that oppressed them, as well as to describe the political disenfranchisement they suffered and the subversion of democracy they experienced. Perhaps that era of everyday intimidation is finally ending. Here are some of the signs of it — literally — from that march I attended: “Loan Sharks Ate My World” (illustrated with a reasonable facsimile of the Great White from Jaws), “End the Federal Reserve,” “Wall Street Sold Out, Let’s Not Bail-Out,” “Kill the Over the Counter Derivative Market,” “Wall Street Banks Madoff Well,” “The Middle Class is Too Big To Fail,” “Eat the Rich, Feed the Poor,” “Greed is Killing the Earth.” During the march, a pervasive chant — “We are the 99%” — resoundingly reminded the bond market just how isolated and vulnerable it might become. And it is in confronting this elemental, determining feature of our society’s predicament, in gathering together all the multifarious manifestations of our general dilemma right there on “the street of torments,” that Occupy Wall Street — even without a program or clear set of demands, as so many observers lament — has achieved a giant leap backward, summoning up a history of opposition we would do well to recall today. One young woman at the demonstration held up a corrugated cardboard sign roughly magic-markered with one word written three times: “system,” “system,” “system.” That single word resonates historically, even if it sounds strange to our ears today. The indictment of presumptive elites, especially those housed on Wall Street, the conviction that the system over which they presided must be replaced by something more humane, was a robust feature of our country’s political and cultural life for a long century or more. When in the years following the American Revolution, Jeffersonian democrats raised alarms about the “moneycrats” and their counterrevolutionary intrigues — they meant Alexander Hamilton and his confederates in particular — they were worried about the installation in the New World of a British system of merchant capitalism that would undo the democratic and egalitarian promise of the Revolution. When followers of Andrew Jackson inveighed against the Second Bank of the United States — otherwise known as “the Monster Bank” — they were up in arms against what they feared was the systematic monopolizing of financial resources by a politically privileged elite. Just after the Civil War, the Farmer-Labor and Greenback political parties freed themselves of the two-party runaround, determined to mobilize independently to break the stranglehold on credit exercised by the big banks back East. Later in the nineteenth century, Populists decried the overweening power of the Wall Street “devil fish” (shades of Matt Taibbi’s “giant vampire squid” metaphor for Goldman Sachs). Its tentacles, they insisted, not only reached into every part of the economy, but also corrupted churches, the press, and institutions of higher learning, destroyed the family, and suborned public officials from the president on down. When, during his campaign for the presidency in 1896, the Populist-inspired “boy orator of the Platte” and Democratic Party candidate William Jennings Bryan vowed that mankind would not be “crucified on a cross of gold,” he meant Wall Street and everyone knew it. Around the turn of the century, the anti-trust movement captured the imagination of small businessmen, consumers, and working people in towns and cities across America. The trust they worried most about was “the Money Trust.” Captained by J.P. Morgan, “the financial Gorgon,” the Money Trust was skewered in court and in print by future Supreme Court justice Louis Brandeis, subjected to withering Congressional investigations, excoriated in the exposés of “muckraking” journalists, and depicted by cartoonists as a cabal of prehensile Visigoths in death-heads. The tradition the Occupy Wall Street demonstrators have tapped into is a long and vibrant one that culminated during the Great Depression. Then as now, there was no question in the minds of "the 99%” that Wall Street was principally to blame for the country’s crisis (however much that verdict has since been challenged by disputatious academics). Insurgencies by industrial workers, powerful third-party threats to replace capitalism with something else, rallies and marches of the unemployed, and, yes, occupations, even seizures of private property, foreclosures forestalled by infuriated neighbors, and a pervasive sense that the old order needed burying had their lasting effect. In response, the New Deal attempted to unhorse those President Franklin Roosevelt termed “economic royalists,” who were growing rich off “other people’s money” while the country suffered its worst trauma since the Civil War. “The Street” trembled. “System, System, System”: It would be foolish to make too much of a raggedy sign — or to leap to conclusions about just how lasting this Occupy Wall Street moment will be and just where (if anywhere) it’s heading. It would be crazily optimistic to proclaim our own pitiful age of acquiescence ended. Still, it would be equally foolish to dismiss the powerful American tradition the demonstrators of this moment have tapped into. In the past, Wall Street has functioned as an icon of revulsion, inciting anger, stoking up energies, and summoning visions of a new world that might save the New World. Steve Fraser is Editor-at-Large of New Labor Forum, a TomDispatch regular, and co-founder of the American Empire Project (Metropolitan Books). A historian of Wall Street, his most recent book on the subject is Wall Street: America’s Dream Palace. He teaches history at Columbia University.